Is Twitter spending heavily in order to keep up with Facebook? It's hard being compared to Facebook (NASDAQ:FB). It's even harder having to compete with it. Such is the fate of Twitter (NYSE:TWTR), one of a group of second-tier social networks. Twitter has been spending heavily in order to improve its product, both on the user end and for its advertisers. While I typically like to see a company reinvest a large portion of its revenue into R&D and improving its products, Twitter is spending quite heavily in order to keep up with a competitor that's bringing in much more money. 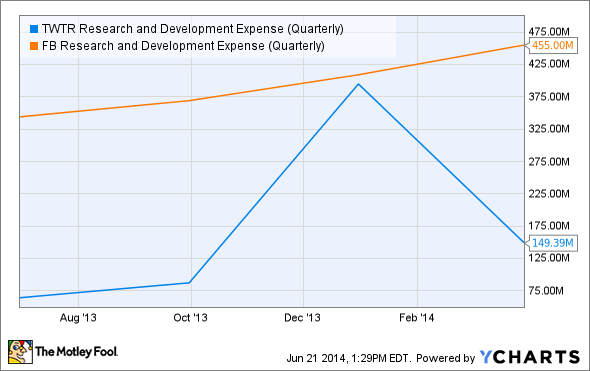 Let's take a quick look at Twitter's R&D expenses compared to Facebook. Source: YCharts. Twitter research and development expense. You'll notice a big spike in the fourth quarter of last year, but that's due to stock-based compensation tied to the company's IPO, so it's not entirely representative of Twitter's investment in R&D. You'll also notice that Twitter spent roughly one-third as much as Facebook on R&D. At the same time it generated just one-tenth the revenue of its larger competitor. As a result, Twitter's net income remained in the red. 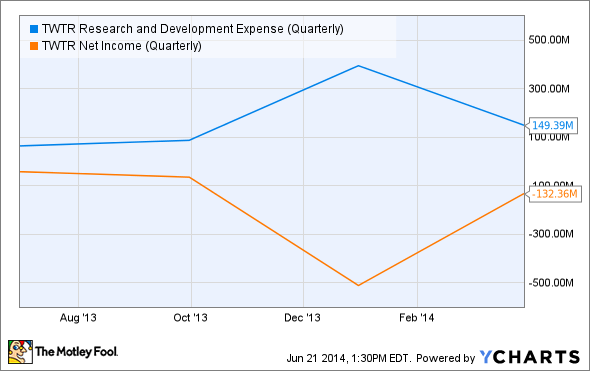 In fact, if you look at the graph below you'll see net income is inversely proportional to the amount spent on R&D. Source: YCharts. Twitter research and development expense quarterly. Twitter spending heavily on R&D isn't necessarily a bad thing, but it certainly requires a closer look. After all, it's the biggest expense on its income statement. So what is Twitter spending all of this R&D money on? One of Twitter's biggest areas of interest is in video. Twitter's advantage over Facebook is that it's become the place for people to find out what's going on right now. Twitter is taking advantage of that through products like Twitter Amplify and its recently acquired SnappyTV. These products allow brands to share instant video highlights of sporting events and red carpet interviews. Investing in video a great move. Video advertising commands a premium over other forms due to its compulsory viewing (you have to view this ad to view the content you want) and the dynamics of the medium. It's an easy way to increase the average price per ad. So it's no wonder that Facebook has pushed toward more video content on its platforms. Not only is it pushing users to upload and share more videos on its flagship site, it added video capabilities to photo-sharing app Instagram last year. Twitter is also focused on easing the onboarding process for new users to get them up to speed more quickly. Additionally, its constantly working on its user interface, particularly on mobile, to keep users engaged and reengage old users. Last quarter, Twitter grew monthly active users, or MAUs, 25% year over year. Comparatively, Facebook grew MAUs 15%. Of course, Facebook is growing off of a much larger base, and added an astonishing 166 million users over the last twelve months. Maybe it's unfair to compare Twitter to Facebook. The two companies aren't as much competitors, some feel complement each other. Nonetheless, the percentage of revenue Twitter spends on R&D is rather alarming. The company needs to show investors that it's worth it. In the last year, Twitter has improved its engagement (measured in timeline views) by just 15% -- similar to Facebook, but with a lower base. Meanwhile, revenue per timeline view has nearly doubled. Facebook meanwhile has increased its average revenue per user by just 48%. Twitter is doing a great job of monetizing its users with ad products such as video, but user engagement and growth is proving more difficult. With just one-fifth the total users of Facebook, there's huge potential. But Twitter's huge R&D budget has yet to show a meaningful impact in that area, and that's concerning.